President Barack Obama on Tuesday nominated a Hispanic judge, Sonia Sotomayor, to the U.S. Supreme Court - a choice unlikely to shift the ideological balance on the country's highest judicial panel. Mr. Obama's selection of the 54-year-old Sotomayor, whose parents moved to New York City from Puerto Rico before her birth, is an exercise of one of the most significant powers the U.S. Constitution grants the American chief executive. The president said he selected Sotomayor based on his search for a candidate with a "rigorous intellect" and "a mastery of the law" and one who recognized "the limits of the judicial role." Sotomayor said "my heart today is bursting with gratitude" and called the nomination the "most humbling honor of my life." Before selecting the nominee, Mr. Obama had said he was looking for a prospective high court justice who would bring "empathy" to the bench, a judge capable of understanding the effects of high court rulings on the lives of Americans. 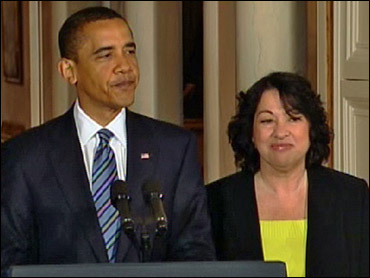 CBS News White House correspondent Mark Knoller reports that as as Sotomayor ended her remarks, Mr. Obama joined in the applause for his nominee and could be heard whispering to her: "Good Luck. You're gonna do great." And Vice President Joe Biden whispered the following to Sotomayor after her remarks: "Told ya. Piece of cake. Piece of cake. You did wonderful." CBS News political director Steve Chaggaris reports that Mr. Obama made his decision this past weekend, according to a senior White House official. According to a senior administration official, Mr. Obama had not met Sotomayor until last Thursday, reports CBS News chief political consultant Marc Ambinder, but he "knew her from reputation" for a long time. Another official told Ambinder that at the beginning of this process, Sotomayor was clearly the choice Mr. Obama wanted, "and the process, nicely enough, ended up where the president began." If confirmed by the Senate, she would succeed retiring Justice David Souter, one of four reliably liberal votes on the nine-member court, and would be expected to vote with the liberal bloc. There are four equally dependable conservative votes, leaving Justice Anthony Kennedy, a centrist, to cast the deciding ballot when the other members split 4-4. Regardless, Sotomayor would inject relative youth into the court's aging liberal wing. Justices serve until they retire or die, giving presidents an opportunity to influence policy long after they leave office. Mr. Obama's nomination is the first by a Democratic president in 15 years. She would join Justice Ruth Bader Ginsburg as the second woman on the current court, the third in history. Former Justice Sandra Day O'Connor was the first woman on the Supreme Court. Mr. Obama's Democrats are just one Senate vote shy of the 60 necessary to prevent a Republican filibuster, a tactic designed to delay or defeat a proposal. But going into the confirmation process an outright Republican attempt to block Sotomayor appeared unlikely. The Senate Republican leader, Sen. Mitch McConnell of Kentucky, issued a statement that said: "Senate Republicans will treat Judge Sotomayor fairly. But we will thoroughly examine her record to ensure she understands that the role of a jurist in our democracy is to apply the law evenhandedly, despite their own feelings or personal or political preferences." Pennsylvania Sen. Arlen Specter, who recently became a Democrat, applauded the nomination. "Her confirmation would add needed diversity in two ways: the first Hispanic and the third woman to serve on the high court. " Republican National Committee Chairman Michael Steele also reacted quickly with the following statement. "There will be opposition, some will try to picture her as an activist, but it's going to be very, very difficult to oppose this woman with this kind of story," CBS News chief Washington correspondent Bob Schieffer said following the announcement. "This was the political advisers dream candidate. In addition to having all of experience, which she does that President Obama cited, the story this woman has to tell, it's going to be very difficult to go against that, especially when you have a large Democratic majority in the Senate." Any decision to filibuster could carry deep political risks - Hispanics are the fastest-growing segment of the population and an increasingly important one politically. Still, Republicans could try to use her nomination to galvanize the party base. Mr. Obama's announcement leaves the Senate four months - more than enough time by traditional standards - to complete confirmation proceedings before the Court begins its next term in the fall. Such statements could provide solace to conservative Republicans who often argue that liberal judges seek to legislate from the bench by imposing their own political philosophy to interpretation of the Constitution. There is the possibility that Mr. Obama, before his four-year term is out, may be given the opportunity for more appointments, allowing him to reshape the court that has, in recent years, moved to the right with President George W. Bush's choice of conservative Justice Samuel Alito Jr. to replace the moderate O'Connor.